SHEC LABS - Solar Hydrogen Energy Corporation, with its partners will deploy the world’s first Solar Hydrogen production station, “SHEC Station #1”, using methane collected from the City of Regina's (Canada) landfill. 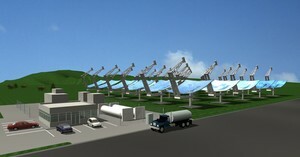 The unit produces hydrogen with solar energy as the primary energy input. 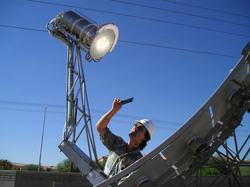 A solar concentrator, pictured, similar to that used in thermal solar dish electrical generators is used. The Stirling engine in the electrical generators is replaced by a reaction chamber that receives the solar energy through an iris that can be controlled to regulate the amount of heat being fed to the reactor. SHEC has developed a solar concentrator that is simple to make using relatively common materials. They developed a process to get the curvatures required to a high degree of accuracy with a manufacturing process that is very inexpensive. Carbon dioxide (CO2) and methane gas (CH4) are fed into a reactor heated by the solar concentrator. In a two step reaction the methane (CH4) and carbon dioxide (CO 2) are first reacted to form hydrogen gas (H2) and carbon monoxide (CO). Solar energy provides the driving force for this endothermic reaction. A water cooled iris dilates to control the amount of radiant energy directed this reaction. The intermediate products are fed into a water gas shift reactor (WGSR), controlled at near atmospheric pressure. This reaction is exothermic and requires cooling to maintain the optimum temperature. The resulting gas stream is H2 and CO2 and is saturated with water. The project will be developed in two stages. In the first stage, a gas cleaning system to produce synthetic natural gas will be installed. By 2007, five solar modules will be installed to produce hydrogen from that gas. In the following year, a total of 30 solar modules would be installed. The project could be running at full capacity in 2008. An artists rendition of the completed project is shown above. The Saskatoon StarPhoenix, Nov 19, 2005 quoted Beck as saying "it costs about $1.25 to produce a kilogram of hydrogen for the fertilizer and petrochemical industries with conventional methods that use fossil fuel and emit carbon dioxide. With our process we anticipate that we will produce hydrogen at 75 cents a kilogram – and that would be a very pure grade of hydrogen – food grade or even fuel cell grade." Hydrogen is a main component in gasoline, fertilizer production, hydrogenating edible fats and oils and host of other industries. Today the most common method of hydrogen production is the steam reformation of our depleting supplies of natural gas causing greenhouse gases to be exposed to our atmosphere. The SHEC technology solves numerous problems such as the destruction of harmful green house gasses as well as the production of clean, green, high purity, renewable hydrogen. It also displaces the use of our diminishing resources of natural gas for hydrogen production. SHEC LABS partners in this project are Giffels Associates Limited (Ingenium) and Clean 16 Environmental Technologies and in is being conducted in conjunction with the University of Toronto Department of Chemical Engineering and Applied Chemistry. SHEC LABS have several patents and patents pending on the solar hydrogen process and process components. They are a research and development company now embarking on commercialization, is a world leader in providing solutions for the production of clean, renewable energy for the emerging hydrogen economy. SHEC LABS, founded in 1996, has developed technologies to more economically harness the power of the sun, reduce the temperatures required for the disassociation of water, more economically produce hydrogen from fossil fuels and produce hydrogen from biomass sources. I am interested to make a form paraboloid concentrator with a solar tracking system but I have difficulties to make the system for programming with the PIC16F84, I ask you help with documentation or other thing.